Something to Muse About: UNFINISHED BUSINESS "Like A Boss" Trailer Released! UNFINISHED BUSINESS "Like A Boss" Trailer Released! The "Like A Boss" Trailer that was too hot for the Super Bowl is now online! 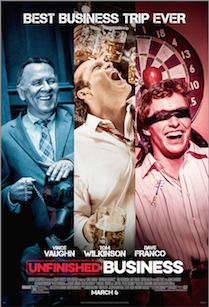 See Vince Vaughn, Tom Wilkinson, and Dave Franco in this hilarious new Redband trailer for UNFINISHED BUSINESS!